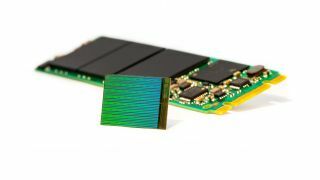 HGST and Mellanox have demoed a new PCM-based persistent memory fabric that can deliver DRAM-esque performance at a dramatically lower cost of ownership. Shown off at the Flash Memory Summit, the new in-memory compute cluster architecture brings the higher level of performance with a greater scalability than before in a lower power alternative that doesn't cost the earth. In addition to the fact the new technology brings reliable, scalable, low-power memory with DRAM-like performance, it also doesn't require BIOS modification or rewriting of applications. Memory mapping of remote PCM using the RDMA (Remote Direct Memory Access) protocol over networking infrastructures like Ethernet and InfiniBand, meanwhile, allows the seamless, wide scale deployment of in-memory computing. The HGST/Mellanox demo achieved random access latency of under two microseconds for 512B reads and throughput exceeding 3.5GB/s for two KB block sizes using RDMA over InfiniBand in what is reportedly a world record time. HGST Research made the breakthrough when they applied the PCI Express Peer-to-Peer technology to create a low latency storage fabric using commodity server hardware. Dr. Zvonimir Bandic, manager of Storage Architecture at HGST Research explained that this was "inspired by supercomputers using general purpose GPUs". HGST and Mellanox's demo comes just a couple of weeks after Intel and Micron introduced a new type of memory called 3D XPoint (3D Crosspoint) that allows computers to read and write data 1,000 times faster than normal hard disks can. It even beat out 3D NAND in the speed department.